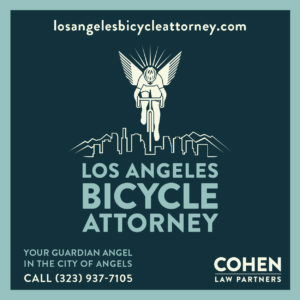 It was exactly a month ago that we discussed the case of Jerry Counts, the 75-year old man who was handcuffed and ticketed for riding his bike on I-15 north of San Bernardino. Even though that’s one of the sections of freeway where bikes are legally allowed. And even though few, if any, motorists are ever pulled from their cars and cuffed for a simple traffic violation. Now Richard Masoner of Cyclelicious forwards word from Caltrans that the CHP has agreed to rescind the ticket. Though apparently, not the indignity of being handcuffed on the side of the road in full view of hundreds, if not thousands, of passing motorists. They also offer a map showing where you are legally allowed to ride on a freeway in Caltrans District 8, along with a list of freeways in Riverside and San Bernardino Counties where bike riding is prohibited (see below). That list was sent to the CHP to distribute to all of their officers in the area in hopes of avoiding another fiasco like the Counts case. Still, if you plan to ride in the area, you might want to print it out and take it with you to avoid riding where you shouldn’t. And to show any officers who try to stop you where you can. Once again, Hollywood is being used as an excuse to fight bike lanes. In a case reminiscent of LA’s first green bike lanes on Spring Street in DTLA, London city barristers have complained that planned bike lanes will make it impossible to film movies in a section of the city that has played host to productions like Harry Potter, Mission Impossible and Silk. Never mind that New York’s protected bike lanes and Citi Bike bikeshare docks seem to pop up in movies and TV shows with ever increasing frequency, without hurting filming in the city one bit. In the LA case, Hollywood production companies successfully argued, over the objections of bicycling community, that the bright green paint initially used for the bike lanes on Spring would be impossible to remove in post production, and would forever ruin the street as a filming venue. Even though it took a film editor all of 20 seconds to do it. But in a city that places a higher value on pimping itself out as a movie set than on livability and the safety of its citizens, city leaders kowtowed to the studios and agreed to strip the paint off. A darker and less visible shade of green was then used to repaint it in sections, rather than the entire lane. Not satisfied with their victory, filmmakers complained that even that would be a problem and argued for the complete removal of the bike lanes, more because it interfered with parking their trucks than the actual effect it had on the filmmaking process. But as anyone who has ridden a bike in Downtown LA can attest, the bike lanes haven’t seemed to limit movie shoots in the slightest. And haven’t kept studio trucks from parking in them, either. Colorado pro cyclist Lauren De Crescenzo has lost her memory, as well as suffering numerous broken bones, following a major crash in the final sprint of the San Dimas Stage Race here in California. According to her father, she barely remembers being a cyclist, let alone what she had for lunch. A gofundme account to help with her medical expenses has raised nearly $40,000 of the $75,000 goal. LA considers traffic calming measures, including bike lanes and safer crosswalks, on Culver Blvd in Playa del Rey. CiclaValley and family experience a week of bad drivers. In other words, pretty much like any other week here in the big city. LA Independent examines West Hollywood’s coming bikeshare system, which will be incompatible with the Metro system planned for DTLA, and eventually, next door in Hollywood. Streetsblog’s Joe Linton questions the value of this weekend’s mini-open streets events in Lawndale and Burbank. Both seem designed to provide the least possible inconvenience to anyone in a motor vehicle, without any significant benefit to the community. A Santa Clarita cyclist thanks the man who witnessed someone steal his bike, then chased down the thief and got it back undamaged. The San Gabriel Valley Tribune looks at BikeSGV and their monthly family friendly bike trains through the valley, including Sunday’s Love Mother Nature Ride. 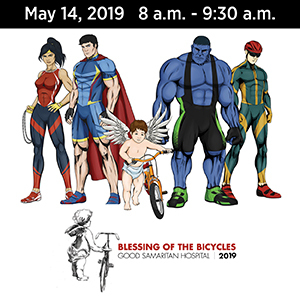 The Samaritan Center is hosting the 4th annual Ride for the Homeless in Simi Valley this Sunday, with rides ranging from five to 100 miles. Thanks to Project Hero Ventura for the heads-up. A San Diego teacher and triathlete was surprised with a new beach cruiser as promotion for next month’s Amgen Tour of California. Six hundred cyclists will ride into Santa Barbara Sunday on the final leg of the L’Etape California, following the 106-mile course planned for Stage 3 of the Tour of California. A Stanford publication asks if the birthplace of mountain biking will become the worst place for mountain biking as Marin County continues to restrict offroad riding. Bike and pedestrian projects would likely be included in a proposed $3.6 billion Sacramento transportation tax measure, though as much as 75% of the funds would be spent on road projects. Men’s Journal says smarter bikeshare programs, including bike libraries and pedal-assist bikes, are coming to a town near you. Unbelievable. 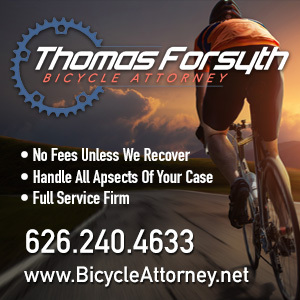 A New York truck driver gets five summonses for various technical violations, but nothing for killing a cyclist earlier this week. The country’s oldest bike race started in 1939 in New Jersey because the son of a local bike shop owner wanted to sleep in his own bed before a race. A South New Jersey paper offers advice on how to teach a reluctant child to ride a bike. Former San Francisco Giants star Barry Bonds rides his bike to work at his new job as batting coach for the Florida Marlins, and takes it with him when the team goes on the road. Not surprisingly, anger is growing in Brazil over the Rio bikeway collapse that killed three people, as ties between the contractor and city officials emerged. A British man is riding the entire length of South America unsupported to raise funds for people in Nepal; however, halfway through he’s raised just $425. A UK writer wonders why more of his countrymen aren’t captivated by watching men in Lycra battle it out on the barely paved roads of Europe. A bike-riding Brit serial groper gets a well-deserved four years in prison. Liverpool, England will use thermal imagery to detect bicyclists at intersections to give the riders an advanced green light ahead of other traffic. Yet another hero cyclist, as a bike rider in the UK wrestled down a man armed with a machete who was attacking a pregnant woman, and had threatened other people. My favorite Scottish blogger and bike advocate measures the cycling support of the country’s political parties. The Philadelphia Sun says Flanders is considered the cycling capital of Europe. Which may came as a surprise to the Dutch. A 70-year old Aussie bike rider was stabbed by a young woman when he refused to let her use his phone. Everything you need to know about motor doping, except how to do it yourself. Evidently, cyclists need to be aware of their surroundings so they don’t follow a bikeway into a lamp post. And who would have thought a column by a self-described bike-hating dyke would be the funniest thing I read today? Sometimes, there’s just no obvious explanation. The San Diego Union-Tribune reports the CHP received a 911 call saying a bicyclist was riding on the northbound I-15 freeway south of West Bernardo Drive/Pomerado Road around 4:25 am. Fourteen minutes later, they got another call, before officers could arrive, saying in effect there was no need to hurry. The victim, who was not carrying identification, was hit by a vehicle while riding in the #2 lane. A satellite photo indicates that would seem to be the far right lane of the four-lane freeway, since the left two lanes appear to be Express Lanes. That’s assuming he was past the northbound offramp; if it happened further south, it would place him in the fourth lane from the right out of five lanes. San Diego 7 indicated the driver of a white pickup stopped at the side of the road for about 10 minutes before driving off. Police are looking for a white GMC pickup based on debris found at the scene. The victim appears to have been struck by multiple vehicles following the initial impact; none of the other drivers seem to have stopped, either. A CHP spokesperson said they don’t know how many times he might have been hit or run over. Under those circumstances, the victim may be very difficult to identify, for obvious reasons. There was no word on whether he was using lights at the early morning hour. And no apparent explanation for why he was riding in a traffic lane on a high-speed freeway, rather than on the shoulder. 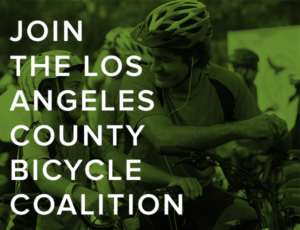 Bikes are allowed on the shoulder of the 15 freeway a little further north, according to the U-T. But never in the traffic lane. This is the 41st bicycling fatality in Southern California and the eighth in San Diego County; that compares with 61 in SoCal and six in the county this time last year.